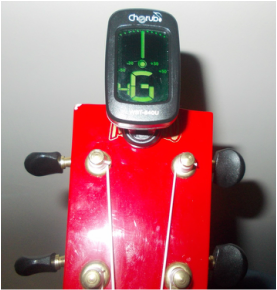 There are two main types of electronic ukulele tuners. The first and easier tuner clips onto the top of your ukulele and when you pluck a string, it tells you whether it is too sharp(too high) or flat(too low). 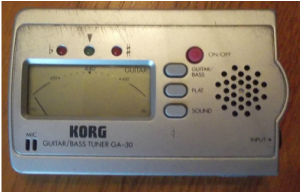 The second and slightly harder tuner plays a note and you tune your string (by ear) to the same note. Tuning a ukulele off a piano is a very simple operation. The strings are tuned in the middle key and the G string is tuned off the middle G key, the C string is tuned off the middle C key, the E string is tuned off the middle E key and the A string is tuned off the middle A key. There is a method that you must follow to tune the strings on your ukulele from the strings on your ukulele. This method involves tuning by ear. Tune the G string (you can use any of the above methods to do this!) . Place your finger on the G string on the second fret and tune the A string from the G string. Place your finger on the E string on the third fret and tune the E string from the G string. Place your finger on the C string on the fourth fret and tune the C string from the E string. You may want to tune the G string after just in case as the strings stretch the fretboard when they are being tuned.